Feta is a Greek brined cheese, popular throughout the eastern Mediterranean, and typically made from sheep’s milk, or goat’s milk. It is a fairy dry, aged cheese that crumbles well; I always keep some on hand for crumbling over a salad, or in a favorite casserole such as pastitsio (pasticcio). And it is excellent in quick pasta dishes such as this one. 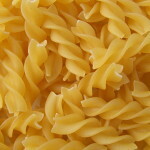 Fusilli is a spiral pasta that works well with cheesy-creamy sauces such as this one, and kids love them. This recipe is adapted from Fine Cooking (1); the original recipe was written to serve 4 – 6, but I’ve modified it to serve 2. One way I’d like to serve this is to toss with cubed chicken meat, for a main dish. I’d also like to try this with snow peas (in the pod). Sauce: Bring stock to a boil over high heat; add peas and cook 2 – 4 minutes until crisp-tender. Remove from heat; using a slotted spoon, remove and reserve ⅓ cup of peas. Transfer broth and remaining peas to a blender. Add olive oil and all but ⅓ tsp of the dill, ⅓ tsp salt and ⅛ tsp pepper. Blend until smooth; it will be thin. Pasta: Bring saucepan of water to boil. Cook pasta in boiling water according to package directions, to al dente. Drain but reserve ¼ cup of pasta water, in case the finished dish is too thick. 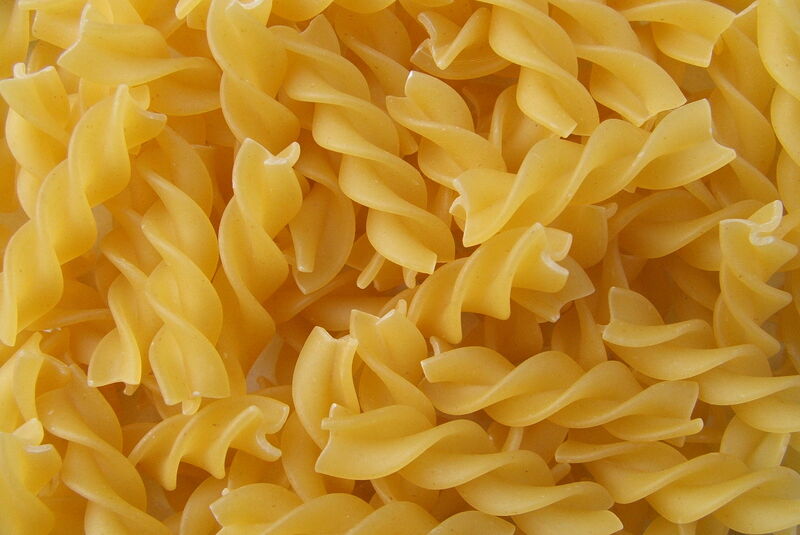 Place pasta in a large bowl. Add the sauce, reserved peas and 1 Tbsp of the feta and toss to combine.. Serve garnished with the remaining feta, reserved dill, and lemon wedges on the side. This entry was posted in Blended, Boiled, Citrus, Dairy, Fat or oil, Herbs, Legumes, Pasta, Stock, broth and tagged chicken stock, dill, feta, lemon, pasta, peas. Bookmark the permalink.